While most of want to be barefoot and wearing just our swimsuits while we surf, the reality is that colder temperatures don’t always allow for this ideal. Wetsuits and other protective articles of surfing gear are important for surfers who want to enjoy the waves all year long, wherever we go, and in any climate. One of the most important articles of gear we can wear is a good pair of surf booties. With so many different options for surf booties on the market, it can be difficult to decide what pairs are actually comfortable and effective and what pairs will possibly worsen your surfing performance or fall apart soon after your purchase. To make the buying process easier for you, we have created this guide that outlines exactly what you should be looking for in a worthwhile pair of surf booties along with our tips fitting and taking care of your booties once you bring a pair home. Round-Toe Surf Booties: This is the most common type of surf booties you’re likely to come across. The rounded toe makes sizing easier in this type of boot compared to the others on the list. They are warm and comfortable, but don’t allow for you to grip the board with your toes for extra balance. We recommend this option for surfers who care the most about warmth over performance. 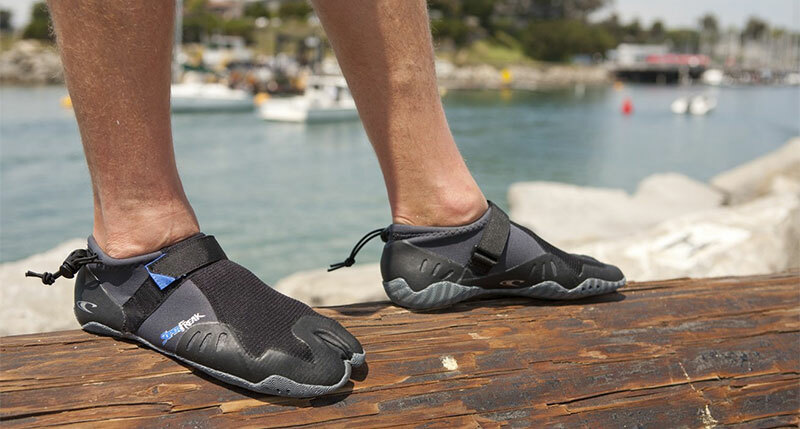 Split-Toe Surf Booties: A great option for experiences surfers, split-toe surf booties separate the big toe for better movement and enhanced balance. However, these boots aren’t typically as warm as the round-toe options. Latex-Dipped Surf Booties: Instead of standard neoprene, these booties feature neoprene dipped in latex. They aren’t typically as durable as standard booties, but they allow for a barefoot-feel that can really improve your performance on the surfboard. We recommend them for surfers who don’t want to lose their performance edge. Just be mindful that they can tear more easily than other options. We recommend physically trying on surf booties before actually buying them for two reasons. First, these booties come in full sizes only, so anyone that wears a half-size will definitely want to try on the next sizes up and down to figure out what fits most comfortably for them. Secondly, we find that one size can fit extremely differently depending on which brand you’re trying on. It is best to try on the booties, or at least do a little research on how each brand’s sizing works. You should also keep in mind that surf booties should be skin-tight around your calves. If the boots are loose, water will be able to get into them, rending them cold and ineffective. Be mindful of this while shopping, and look for boots that are tighter around the leg than they are in the toe area. The typical neoprene thickness for surf booties is 3 mm, 5 mm, or 7 mm. The biggest reason to choose a thicker neoprene option is the additional insulation, which keeps your feet warmer out on the waves. In most surfing conditions, the 3 mm option will suffice. Neoprene is naturally warm and insulating without extra thickness. However, if you frequently travel to colder climates or live in an area that doesn’t receive much warm weather at all, then the thicker surf booties might be a better option for you. You will need to roll up the leg of your wetsuit in order to properly fit your surf booties to your body. To keep them snug, roll your wetsuit legs back down over the booties and make sure that there are no air pockets between the two layers. Doing this will keep water from getting into your boots as you surf. Make sure that the inside of your boots are staying dry throughout the day. If they do somehow fill with water, it becomes much easier for them to be yanked off by a wave and lost for good. When you take your surf booties off at the beach, be sure to rinse them out. You will definitely want to make sure that they are clean before you allow them to dry. Otherwise, your booties will smell like sweat and the ocean, and you’ll have a hard time getting that scent to go away. It also helps to dry them in a shady area. At home, store your booties in an airy and open area so they can breathe until you use them again next. Taking care of your surf booties will ensure that you’ll be able to use them for years to come without having to replace them more than necessary.